Life and work have been a bit crazy (in good ways, though!) for me the past few months… I’m actually working from home this month, which is a new experience for me (those long periods of sitting at my desk editing my resume and searching for work between jobs don’t really count as working from home because they didn’t come with a paycheck attached). But it’s certainly got its benefits… wearing pajamas all day? Check! Home-cooked lunches? Check! 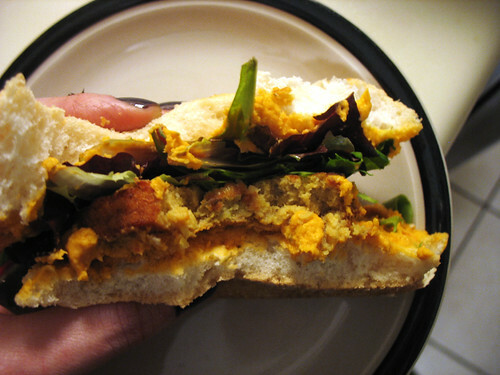 …Which gives me a chance to try some new store-bought veggie burgers! I’ll admit, the name was half the reason I picked this box of veggie burgers from amongst all the other choices at Whole Foods. The other half of the reason was they they were among the cheapest! And they’re vegan. 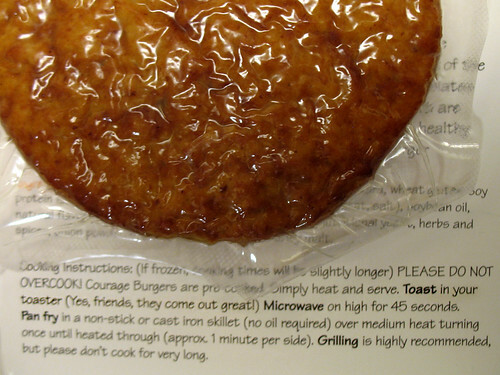 The instructions on the back of the box suggested heating the patty in a toaster – which sounded so crazy and unusual that I just had to try it! 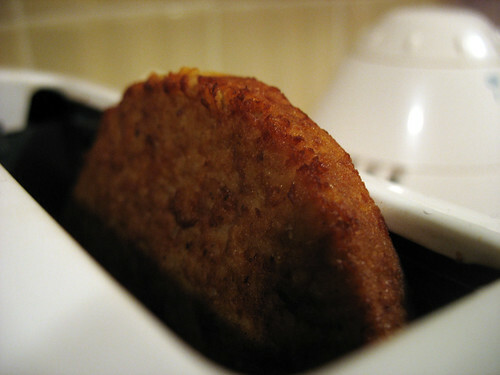 And surprisingly, this cooking method actually worked pretty well – nicely crisp on the outside, and warmed all the way through the insides. Oddly, although most people associate traditional meat-burgers with beef, these burgers claim to have “the terrific taste of chicken” – which certainly proved true when I tasted them. They were more like faux-chicken patties than faux hamburgers, certainly. But the texture was less stringy than most faux-chicken I’ve eaten. This was more like a mash, although it still held together quite firmly. The flavor itself was mild, slightly sweet. It probably would have been best paired with a slightly spicy or sweet and sour sauce, but I wanted to use up some leftover sundried tomato hummus so that was what I put on mine. I’d probably market this as more of a chicken patty than a burger patty, since it was not too memorable as a burger. But I think I prefer the Boca chicken patties over this, if chicken is the flavor I’m going for… I actually chopped up and fried the remaining three patties in a stir-fry a few days later, and enjoyed them much better that way! 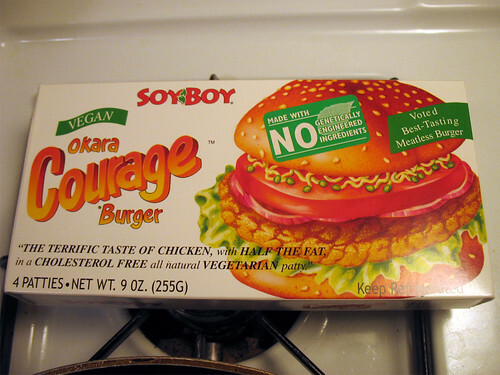 Just and FYI...The SoyBoy Courage Burger is made from Okara, not Okra. Okara is the soybean solids left over from making soy milk. Very nutritious, and used extensively in Japan. It is often sauteed with vegetables, and served as either a side dish or a main course. This is the first time I have seen your blog, and really enjoy what I have read so far. 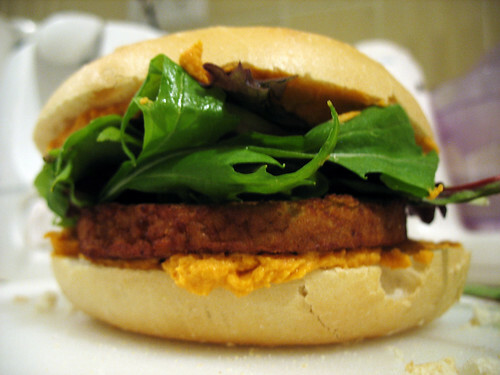 Emily - Thanks for the link, that sounds delicious, I've never tried a veggie burger made with couscous before!